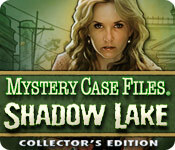 Mystery Case Files®: Shadow Lake Collector's Edition is rated 2.6 out of 5 by 839. Rated 5 out of 5 by helmcken from More, please!! I'm SO happy I finally got to play this game! I was one of those who was unable to play initially, due to (then UNPATCHED) errors preventing the game from running past the opening scene! It would open and just sit. Several years later, I tried again. To my surprise, it ran perfectly! WHAT A FUN GAME!! This is a real treasure! I love the mix of live action with puzzle and H.O. scenes! The acting was talented enough to not distract. I also love the hidden tie-in to Madame Fate with the coin-operated game machine in one scene. Like everyone else, Jack Talon made me roar with laughter! The storyline was (while nothing new) decently done to hold my interest throughout. I'd like to see MCF/Big Fish do more in this style, please! All my favourite MCF markers were there, from morphing objects to puzzle games to the core hidden object scenes. Full marks across the board. For those who had earlier difficulties, try running the game again. Like me, you may be pleasantly surprised. Rated 5 out of 5 by Cherubabies from Spectacular! The Hint system was very different and sometimes a bit difficult but I just loved the Story line. The Story was superb. Could have had a more spectacular ending with the Demon coming to life and then dying again which was what I was expecting. 5 Stars all the way for this Game! Rated 5 out of 5 by bjdavis from Can't believe the number of bad reviews! I am writing this November 25th 2016. I'm mentioning the date because this game was released in 2012 and it is STILL one of my favorites, which is why I am playing it all over again. 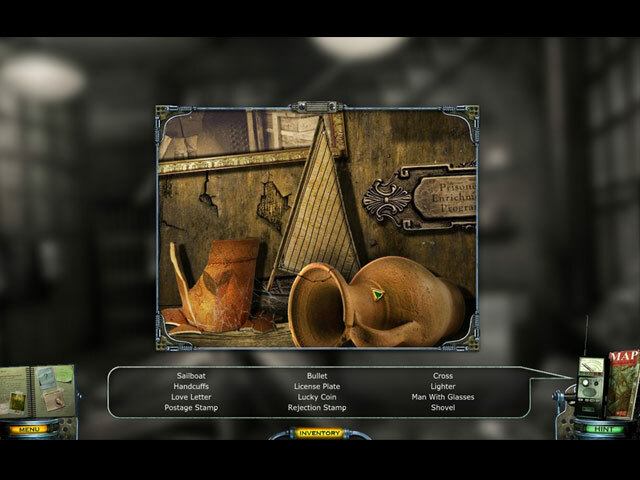 Now this is a perfect example of why I LOVED the MCF games in the first place --- they are nothing like your run-of-the-mill hidden object / adventure games. The uniqueness was what drew me to the MCF games and kept me anxiously awaiting the next one. I must say, however, that I have not been impressed with the last few MCF games as the very format or style has changed and they seem to have become just like any other hidden object/adventure game. I keep hoping that the next one will return to the "Shadow Lake" and "13th Skull" type of adventure. Time will tell! Rated 5 out of 5 by CreateInMedia from No Expectations - Makes it More Fun! I realize this review may never be seen and that the game may only get a few purchases here and there but I wanted to speak on it. I pulled it up to play it again and as I was, I was telling my wife she should too. Why? Because the game is UNIQUE! Yes, if you go into a game placing expectations and have super high standards (which admittedly is not always a bad thing!) then you may be disappointed. If, like myself, you thoroughly enjoy the MCF series, but wanted more of the exact same thing then you are going to be in for a shock. I enjoy being surprised. I enjoy starting up a game and being presented with something that is different, unique and has a style completely of its own! Now since plenty of other reviews are very revealing, I feel I can say a few things without ruining it with spoilers. Lea Thompson could have done a better job here. I was disappointing with a professional actress not being believable. As you may notice, I am a forgiving person since I still rated it a 5. That is because the overall 2.5 is very misleading! Talking with real people is very cool. The story line is much better than others are saying. Yes... the puzzles are repeated. But the HO scenes are very cool because they almost reminded me of the early days of Hidden Object games like "Amazon" that made it difficult to find. While I am a huge fan of easy games because i am nto a big fan of playing a game using the hint button over 30% o the time... I am also glad to see "hidden" objects stand up to the title! Hidden! Well blended in and takes a little time to discover. Not screamingly hard like the games of old, but enough to make the puzzle last more than 1 minute. The map is very good.... jumping from scene to scene was super easy. Not being able to jump to rooms in the scene was a bit disappointing but I also realize the map would not be the same if that were included. We put the headphones on and played for 3 days. I can understand why some would not want to rate it a 5. But a 1 or 2 rating on a game like this is way off base, not fair to the nature of the game and can only come from having placed a high expectation on something they wanted instead of allowing room for inventive, creative and uniqueness. I like that latter and can appreciate a game for what it is... even if it is part of a series, it can also make a great stand alone. It has excellent atmosphere and on 'easy' still had to utilize about 5% hints. We LOVED it! Because we did not go in with any expectations except to play a game. Rated 5 out of 5 by hatzic from Engaging - and tough I too am so surprised at the low score of this game. Where are the MCF fans? The cutaway scenes are excellent - amazing quality cast - Lea Thompson as Casandra? Are there no BTTF fans either? Totally entertaining! The game was tough to figure out at times and sometimes counter intuitive (putting out a candle with a spoon). The puzzles ranged from easy to really challenging. I didn't like everything about the game - I don't like out of control inventory bars that auto-hide at the bottom of the screen and you end up in a constant battle between calling it up or leaving a room. Just not smooth play. And having to go and get the ladder from wherever you left it - that was alright, but didn't really add to the game. For instance, at one point you need it but it's not in your inventory, so you don't know that you need it and it's not there to try, and at the master detective level there is no hint at all why you can't get into the area. Also sometimes the game play was either choppy with no clear idea where to go next, or repetitive when you knew the next step in a cycle. Apparently there were morphing objects to get? I didn't see one. The HOGs were pretty tough too and sometimes impossible to see the objects. However, aside from those minor issues, the production value and acting made this game so campy and fun that I loved playing it. Really memorable characters! (Also like the little nod to Madam Fate on the game console in the town). Rated 5 out of 5 by 186FleetStreet from A new favorite for me? Definitely! I honestly don't see how this game is so hated. It was really fun and creepy, especially the ghost in the schoolhouse. I honestly hope this one gets a "sequel," like some of the other games in the Mystery Case Files series.